Retro-Speedway and Malcolm Simmons have built up a strong relationship in recent years with books, DVDs and magazine columns being the result. 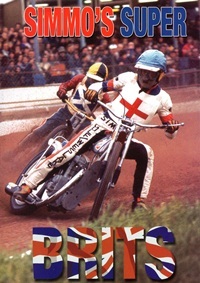 Their latest joint venture is "Simmo's Super Brits" a DVD in which Simmo talks us through the most significant British riders he raced with and against. Given his lengthy career, it's not surprising that many names are covered in broadly chronological order - starting with the Boocock brothers and ending with Chris Louis and Joe Screen. Included in the list are all the big names - Peter Collins, Dave Jessup, Gary Havelock and Michael Lee - but there are also many more unsung heroes such as Reg Luckhurst, Richard Knight and Bob Kilby. The format is straightforward - Simmo sits in his favourite armchair and is interviewed in 'talking head' style while clips are interspersed to demonstrate the abilities of those he talks about. It's a marvellous vehicle to showcase a wonderful selection of old action clips - mainly taken from the big individual, test and pairs meetings from the seventies through to the nineties. Simmo is an entertaining host and is able to offer many insights into the riders and the tracks he raced them on. He recalls quite how impressive Jimmy McMillan was around the old Glasgow White City track and states that Jimmy would have been World Champion if all tracks had been like that one. He suggests that Martin Dugard could have gone much further in the sport if he'd had a larger home track. He opines that Jeremy Doncaster was just too laid back to ever make it to the very top. Interesting and informed views from someone who has been there and done it. His comments are fair and considered, while he stops short of ever 'slamming' a rider he doesn't hesitate to point out mistakes they made or why he believes they underachieved. He also praises where due - Peter Collins, Terry Betts and Mark Loram are amongst those receiving particular praise. His recollection of meetings and events from many years previously is impressive and his general knowledge of speedway admirable. At the end of the DVD Simmo nominates his own selection of the best seven Brits and talks about his own impact on the sport. He's open and honest and it's clear he's proud of what he achieved. It's a well produced product and guaranteed to hold the interest, though with such a lengthy production you may choose to watch in instalments. Picture and sound quality are good throughout and it's up there with the best DVDs that Retro-Speedway have yet released. You can watch a preview video on the Retro-Speedway website. How to order "Simmo's Super Brits"